The Castro - Usually, being bumped off the historic "F" streetcar line at Market/Noe can be a bummer, especially in bad weather. But today, as i was directed to disembark by the operator, I turned to look East down Market Street, and spotted a slender, blue streetcar. One that I had never seen before. Apparently, i was witnessing an initial test run of the return of one of the most unique streetcars in the historic fleet, a carriage from San Francisco's Sister City of Zurich, Switzerland. "In June, 2004, Market Street Railway facilitated the delivery of Brussels No. 7037 to the San Francisco Municipal Railway (Muni) following its retirement. 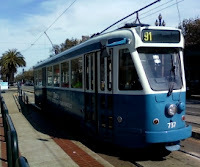 Muni modified the tram for service in San Francisco, and renumbered it to 737. 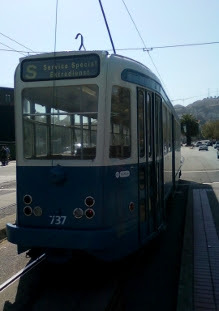 In June, 2005, the car made its first appearance on the street, but at the request of Mayor Gavin Newsom, it wears the blue and white livery of San Francisco's sister city Zürich, Switzerland, which operated similar looking cars (but narrow gauge and non-PCC). In the future, No. 737 may be restored to its original 1952 cream Brussels livery" (via Market Street Railway). The streetcar was running in 'training' mode, so it stopped without passengers. The exterior was this almost periwinkle blue that reminded me of the sky if you look straight up. The driver threw open it's doors, revealing a classic interior with abundant wood and brass adornments. The gleaming paint, authentic emblems, touches of gold and the window trim were among the notable details. I hope to see this streetcar more frequently, and soon i hope to ride this historic piece of our living, moving past. 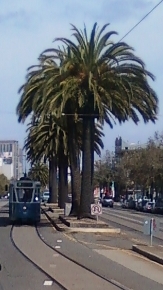 View of train approaching Market/Noe from the east. 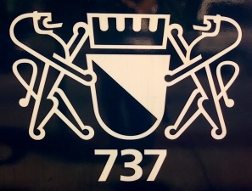 Insignia located along the side, close to the rear. Cool! I saw an F car without a top the other day!